@BlueBasilisk: Lots of interesting food for thought here! I'm not sure I agree with everything, but I need to let things marinate a while before I can meaningfully reply. Except for a couple of points. BlueBasilisk wrote: As for the Mark.06, I seem to be in the minority as I don't believe it was ever intended to be the True Evangelion. Gendo and Fuyutsuki speculate that it might be, but they also weren't aware of any plans beyond Unit 05 and leave open the possibility of more 'undisclosed apocrypha' that they don't know about. EvaGeeks Wiki wrote: Later, the white cover is removed and the Eva undergoes the process of outfitting. The exposed skin on the head is dark gray. The mask remains affixed to the face, but the part over the eyes has been cut away. What looks like a temporary covering is held over the eyes as the helmet is readied for application, as though to avoid "gazing upon the face of God". That is, the effort to keep Mark.06's face covered at all times may be an allusion to the Biblical God, and continuing the theme started with Lilith in the original series. According to Exodus 33: "You cannot see my [God's] face, for no one may see me and live". BlueBasilisk wrote: The FoI could simply be waste material from a misfired Third Impact. Not all of Seele's desired pieces were present, after all Perhaps they have the Fruit but weren't given souls, or they do have souls but didn't get the Fruit to give them power, leaving them immobile husks. Reichu wrote: Their souls do not yet possess the Fruit of Life, an omission perhaps reflected in the glaring lack of a cranium. It's hard to be perfect when you don't have a head. And every single FoI is missing this anatomically critical feature. They seem to be CREATED that way. However, there is a gigantic pile of skulls in Lilith's chamber (see above my suggestion for how they got there)... This, along with Lilith's own decapitation, implies a very strong link between the FoIs and Lilith. But what could it be? During 3I, Lilith is not merely herself, but — bringing to mind EoE — a composite being. She is Lilith, 06!Adam, and 12th Angel. Since her chamber is described as the 3I epicenter, it can probably be assumed that this composite being is the original impetus behind 3I. It's the force that is causing both the landscape to transform and people to turn into mini-Evas that then spontaneously seek out Instrumentality. We see, from the FoIs clustered around Lilith's head, that they are attracted to her in some fashion. This may also explain the FoIs plugging up the main shaft. As indicated in BB's FoI post, the FoIs get increasingly less developed the further away from the epicenter they are, so logically the inverse applies: those closest to Lilith reach “near-perfect” state first. In an attempt to become perfect — achieve Infinity — they must, perhaps, contact Lilith themselves. Are the skulls more than just bone? Do they — or did they, perhaps — contain the Fruit of Life? This might be hypothetically possible, if they were created from the chamber's LCL after Lilith became a composite being with (presumably) access to the Fruit of Life. Hence, once a failure reaches the chamber and claims a head for itself, it becomes complete both physically and spiritually. The whole "souls? y/n" thing is also discussed in that thread. To me, the evidence suggests that the FoI represent human souls undergoing successive fusions. The more mini-Evas/human souls that merge together, the bigger and more "perfect" the Eva becomes, and likewise the more perfect (= complemented) the composite soul becomes. I don't think they're wrong about Seele wanting to create a real god with the Mark.06. As a genuine Adam, a being who possesses the Fruit of Life and possibly both if it's true that the Radiant Giants are their native forms, I think more than qualifies for that status. They've never clarified if the other Evas are still sourced from the Adams like the TV Evas were but they do seem to be made in the image of the Adams. They're man-made imitations of God while Mark.06 is the real deal. But I don't think that necessarily means the Mark.06 was Seele's ultimate end game or that it precludes the possibility of another Eva to follow. I admit my thoughts on this are probably being steered by that preliminary version of Unit 08 with double entry plugs seen in the 2.0 NEP, but I feel like a two-seater along those lines was what they were shooting for and Eva 13 was how it was ultimately realized. What do you make of Kaji's last line in the movie? I've seen it translated a couple different ways. On the wiki he says Unit 01 was triggered "before the rest were present," but in the subs I've seen he says that it was "before the other Units were ready." Other than Mark.06, what's left? Units 00, 03, 04 and 05 were all destroyed. I had an interesting thought today. Is it possible Seele had originally intended for Eva-infused 10th Angel to make contact with Lilith and trigger the Third Impact, and they had Mark.06 standing by with the Spear of Cassius to stop things before they progressed too far? Seele didn't want Unit 01 to awaken right then, if at all, but if it hadn't the 10th would have smashed through NERV's defenses and headed right down the main shaft relatively unimpeded. Pretty fortunate for NERV that it made a pit stop in the Command Center to menace our heroes. Right after the warning for the 10th Angel goes out, we see Kaworu suited up and waiting with the Mark.06, and he says the time is at hand. Seele clearly knows something is about to go down if they're mobilizing their God and arming it with a Spear of all things. Is it really possible they were anticipating the awakening of Unit 01 right then though? Gendo and Fuyutsuki do think Seele is aware of their goals, but midway through the movie, right after Unit 04 is lost, Gendo says that they have to speed up the awakening of Unit 01 in response to Seele's plans for the True Evangelion and the Mark.06. I find it kind of hard to believe that they not only would have foreseen that change in Gendo's time table, but also the rejection of the Dummy Plug, Shinji running away and returning, Rei getting eaten, and all the little pieces that had to fall into place just so for Unit 01 to be triggered. Especially not when they don't seem to be fully aware of what Gendo does right under their noses. The awakening could have been avoided entirely simply by having Mark.06 drop in to dispatch the Angel, but it doesn't do that. It doesn't help out in the battle at all and takes no action except to stop Unit 01 at the very end before it can carry out Third Impact. Why is that? It's possible that Mark.06 simply didn't arrive until that moment due to the long distance between the Earth and the moon, but I think it was waiting for something and N3I was significant enough that it was forced to move. The 10th Angel crushing NERV weakens Gendo's position, leaving NERV vulnerable and sweeping the Evas in his control off the board by destroying or incapacitating them, just like he was trying to do to them. Mark.06 is the last man standing which leaves Seele poised to take control of things like we saw in 3.0, just with Mark.06 instead of Mark.09. Plus if the Angel causes Third Impact, or even a Near Third Impact, they can use that as leverage to get Shinji and the others to work together with Kaworu toward the ultimate goal of Instrumentality. Deliver hell with one hand and peddle salvation with the other. 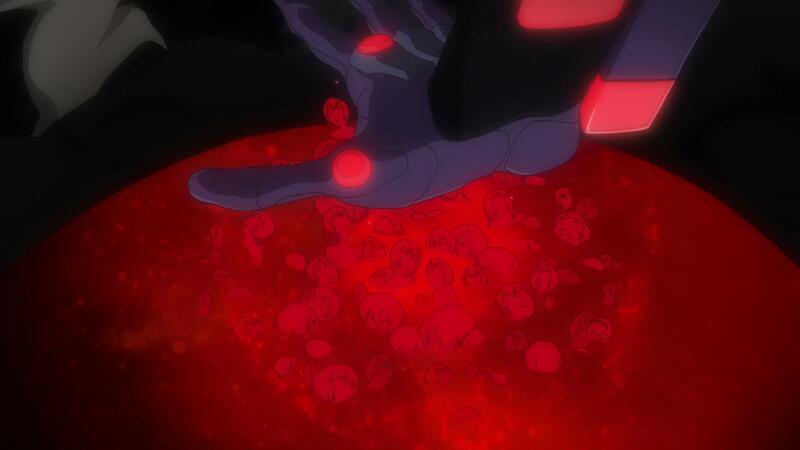 Seele could have sacrificed one of NERV's Evas to make a mess like the one we saw in 3.0. Hell, maybe they had hoped or anticipated that the Angel would take Unit 01. It's an Adam too yet they don't seem to care about it all that much, and if it had been piloted by a dummy plug, Shinji would be fine and that would pose no significant impediment to their plans. An autonomous Adam being absorbed by one of the Angels? But Uni 01 was victorious, Shinji disappeared, and the chain of events that followed lead to them needing to sacrifice the Mark.06 and putting the last Angel into suspension instead of killing it. I don't think the Angels necessarily needed to be defeated before 3I happened, or that it needed to be the 12th that caused it. That Angel was killed long after it happened after all. I didn't factor the Vessel into this scenario because 1) it wasn't around at the time as far as we know, and 2) I really wonder if it was something they intended to create all along or if it was a product of revised circumstances. That and it's a huge headache. Wow, I forgot all about some of the posts I'd made in that thread. Wow. Talking about the same movie for 6 years will do that to you. But I think we're much closer to being on the same page regarding the FoI now! 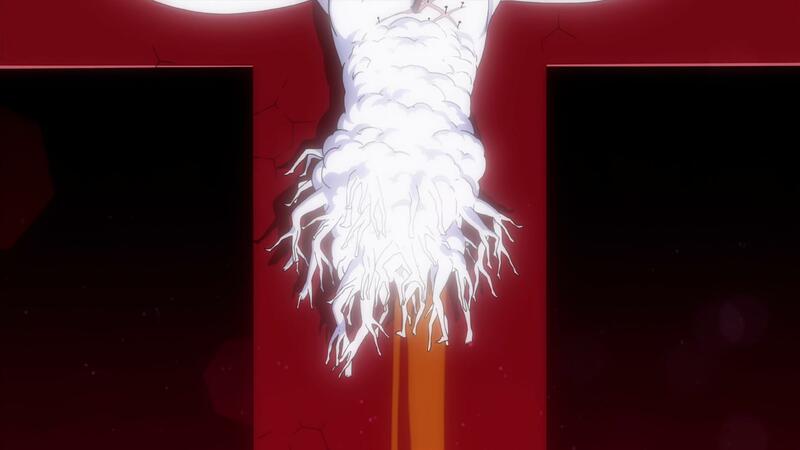 Adding a bit more to your idea that the head possibly equals the Fruit of Life: Remember those little deformed Reis Unit 01 formed in the 10th Angels core when it was trying to fish out Unit 00's core? They're made out of a being already possessing the Fruit of Life. And how do they emerge from the core? Head first! And in varying sizes. But the final Rei created is perfect. Eva sized, no imperfections or malformities at all. The...thing made from Lilith's remains and the 12th Angel was behaving similarly. The inside of that giant core was lined with malformed Rei heads with no bodies. The core itself even briefly morphed into a giant head before starting to take the shape of a full body. Being made purely out of Lilith, these shouldn't possess the Fruit of Life. And what do you know, they form body first. Disfigured, jumbled, partially fused and most importantly, not a single head to be found among them. But they're still connected to Lilith, kicking and writhing around and showing signs of at least rudimentary life in spite of that! What the hell are those things, anyway? I thought they might be partially formed Ayanamis but if Lilith is Eva-sized then they're much bigger than a human. They're gone in 3.0 but we have the FoI instead. Posssibly connected? The FoIs in the main shaft look like they're climbing up rather than down, so I wonder if perhaps Lilith was ascending up the main shaft (to raise the Black Moon like Unit 13?) and the FoIs that were there clambered up after her, attempting to merge with her like Rei did with Unit 01 Maybe that's why she's so bloated? She's full of incomplete FoI gunk? Edit: Oh! Oh! Think about what happened to the 10th Angel after it absorbed Unit 00! It sprouted a human-esque body but kept the Angel part as the head!